Moffitts Farm has been used for trialing pasture varieties and grazing methods since 1993 and with regular soil testing and full monitoring of livestock carrying capacity and rainfall since then is providing some useful anecdotal information. The evolution of management methods developed into the concept we call “Comfortable Farming” – farming that is comfortable for the livestock, comfortable for the biodiversity and comfortable for the family. How has soil fertility, particularly plant available phosphorus (P) changed over the years and especially since 2000 when the last application of superphosphate was undertaken? What has happened to soil organic carbon (SOC) percentage over the years? What has happened to paddock livestock carrying capacity. 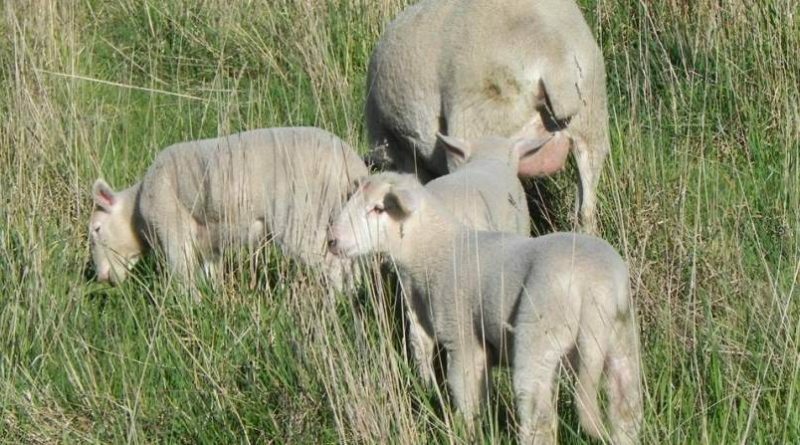 From 1993 to 1999 Moffitts Farm participated as a demonstration site for the Victorian Grassland Society/Vic Dept of Agriculture’s Triple P program during which superphosphate was applied based on the rule of thumb of 1kg P per dry sheep equivalent. The thinking behind Triple P was the higher the fertiliser amount applied per year the greater the pasture production and provided it was grazed efficiently (greater than 75% utilisation) stocking rate could be increased and subsequently profitability of the livestock business would increase. During those years stocking rate, measured in dry sheep equivalents (dse) on the control paddock varied from 8 – 10 dse/ha and on Triple P paddock from 15 – 22 dse/ha. An annual application of 8 -20 kg P/ha was applied by topdressing with superphosphate (potash and lime were also applied intermittently during the six year project). Moffitts Farm pastures are defying conventional advice that to maintain recommended plant available phosphorus level superphosphate must be applied annually. No superphosphate has been applied on Moffitts Farm since 2000. 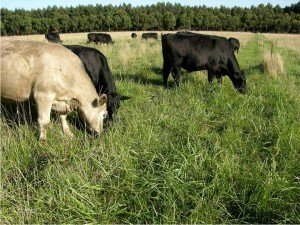 Photo shows steers grazing a tall fescue pasture in February 2011. 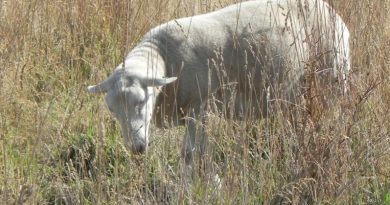 By 2000 it was time to reassess pasture management in light of particularly interesting results being demonstrated by farmers in northern NSW and Queensland with holistic grazing management (also called time controlled grazing and cell grazing). These farmers concentrated management around their pastures, putting these first and adjusting livestock carrying capacity to suit rainfall conditions. 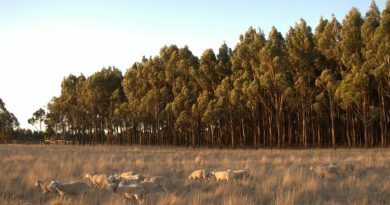 Pastures were rested after grazing for a minimum of three months but in pastoral districts this period could extend to a full wet season or even a full 12 months. Selling all breeding cows and shifting to a cattle trading operation. Provides the flexibility to adjust numbers based on maintaining 100% pasture cover year round. Shifting all stock into one herd to allow for long rest between grazings (90 – 120 days) and to concentrate grazing pressure when stock are in each paddock (70 – 140 dse/ha). Paddocks were further subdivided with single wire electric fences to achieve the grazing pressure for the desired number days (around 7 days). Ceasing to apply fertiliser on a regular basis based on carry capacity. Soil tests showed that Olsen P levels were now above 20ppm and other nutrients were adequate, soil organic matter levels were high (above 8%). Ceasing fodder conservation. Allowing the spring excess of pasture to remain as standing feed substituted for conserved fodder, no machinery was required to feed out, no fodder making costs were incurred. Ceasing to use animal health treatments such as worm and lice control products. The three to four month rotation ensured the livestock worm larvae life cycle was shut down reducing their eggs or larvae numbers. As well, the perennial grass crown size and structure kept most leaf tips at least 10 cm off the soil, so worm larvae which reside on the ground and move onto blades of grass when moisture is present were mostly not in the livestock “eating zone”. Sowing year round green and highly summer active pasture grasses, legumes and herbs. Living with pasture dominated by grasses where entry level biomass starts at 2500 kg to 5000 kg dry matter per ha with minimum exit level of 1500 kg per ha. Contemporary southern Australia pasture recommendations suggest a minimum of 30% annual sub clover content and entry maximum biomass level of 2000 kg dry matter per ha and exit level to 600 kg per ha. The above grazing method forms the basis of what we call “comfortable farming” as it works with nature to grow the pasture livestock can thrive on year round without resorting to support from regular artificial inputs. It enables livestock production to be maintained at moderate productivity levels (kg of liveweight per hectare per year or per 100 mm of rainfall) with minimal costs of production. It also ensures whole farm ecosystem services are being improved and in times of climate stress (like extended dry periods and droughts) are protected. The Triple P program used high amounts of artificial and costly inputs to boost livestock carrying capacity. High pasture utilisation meant grasses were mostly eaten or cut for hay and silage in spring. If little summer and autumn rain fell, the hay and silage is fed back adding to costs of production. 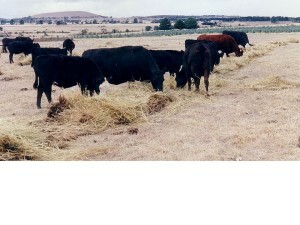 This photo in April 1997 shows hay feeding to maintain the Triple P stocking rate trial herd. What has happened in the soil? Regular soil testing every August since 2002 has uncovered some interesting results. The impact of the Triple P program on soil P level was significant, doubling the available P level in 10 years. But what is extraordinary since holistic grazing commenced is the fact that soil phosphorus levels have defied contemporary conventional recommendations by staying above 15ppm every year without an annual “maintenance” application of inorganic phosphorus fertiliser, figure 1. Figure 1: Plant available phosphorus levels at Moffitts Farm 1989 to 2011. Soil organic carbon percentage has remained constant and seems to be related to rainfall pattern, figure 2. This stands to reason as rainfall prior to soil testing (undertaken each August as soil moisture content is similar in that month each year) controls pasture growth which in turn impacts pasture biomass and the above and below ground organic matter availability for the soil food web. The abundance and diversity of microorganisms influences organic matter mineralisation. Figure 2: Soil organic carbon levels in Moffitts Farm paddocks 1989 to 2011. Under holistic grazing management pasture biomass levels are constantly held at a high level, the soil food web is protected from heat extremes, and soil moisture level is less variable. It is highly likely soil organic carbon level has reached equilibrium and as shown in figure 2 fluctuates around annual rainfall. An unanswered question about the Moffitts Farm SOM is what is its composition, that is what percentage is labile (short-term or decomposable organic matter) and what percentage is non-labile (long-term non decomposable or very slowly decomposable organic matter – also called humus). USDA data demonstrates that both components are variable in every soil. Standard soil tests do not identify the two major types of organic matter present and the Carbon Farming Initiative is only interested in the non-labile component. Using USDA calculations for mineralisation it is possible that the 8% SOM on Moffitts Farm is producing an average annual nutrient release of 62 kg/ha soil organic nitrogen, 6 kg/ha soil organic phosphorus and 2 kg/ha soil organic sulphur. This may explain why Moffitts Farm carrying capacity is being maintained over the last 13 years without the addition of phosphorus and nitrogen fertilisers. Livestock carrying capacity is calculated for each paddock on Moffitts Farm with every grazing period and number of livestock involved monitored. Carrying capacity varies between paddocks and since 2003 is 2 – 3 dse/ha/100mm of rainfall. Some paddocks have consistently higher carry capacity than others. As a small farm, ability to take advantage of wet years by increasing stock numbers is limited as costs of buying and selling are high and agistment in the district is not in demand. This means we can produce feed far in excess of requirements. This has not been an issue in most years as even dry feed is utilised to some extent the following autumn and winter as standing feed as well as being trampled onto the soil surface where is provides a protective mulch and becomes a source of carbon for the soil food web. Excess became an issue after three above average rainfall years in a row and some slashing was introduced in autumn 2013 to ‘top’ thick seed heads on cocksfoot, phalaris and tall fescue plants in some paddocks. It can be an imprudent decision to take action against excess pasture growth as it can provide a critical buffer when unexpected rainfall events occur. 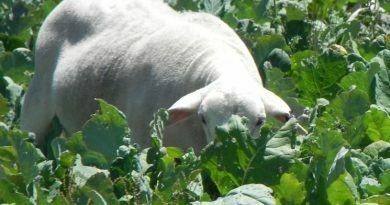 This was the case in 2012 when winter rainfall was extremely high; the thick pasture ensured little pugging damage occurred. Later that year rainfall stopped virtually completely in September and we experienced one of our driest and hottest summer on record. Once again the excess pasture growth in strong perennial plant crows provided protective shading for soil, maintaining some soil moisture and ensuring a low level of green pick persisted throughout summer. The thick pasture also provided soil protection when the first thunderstorm occurred in late February 2013, ensuring all rainfall soaked in. Within three days the perennial grasses had 2 – 3 cm long leaves growing from the crowns. The carrying capacity achieved since 2002 is below that obtained under the Triple P program high input paddock from 1994 to 1999. In that trial carry capacity reached 4 dse/ha/100 mm rainfall. But it also incurred the extra cost associated with conserving fodder and feeding it back in autumn and winter to maintain the stocking rate. How do Moffitts Farm paddock soils compare to ungrazed adjacent roadside soil? 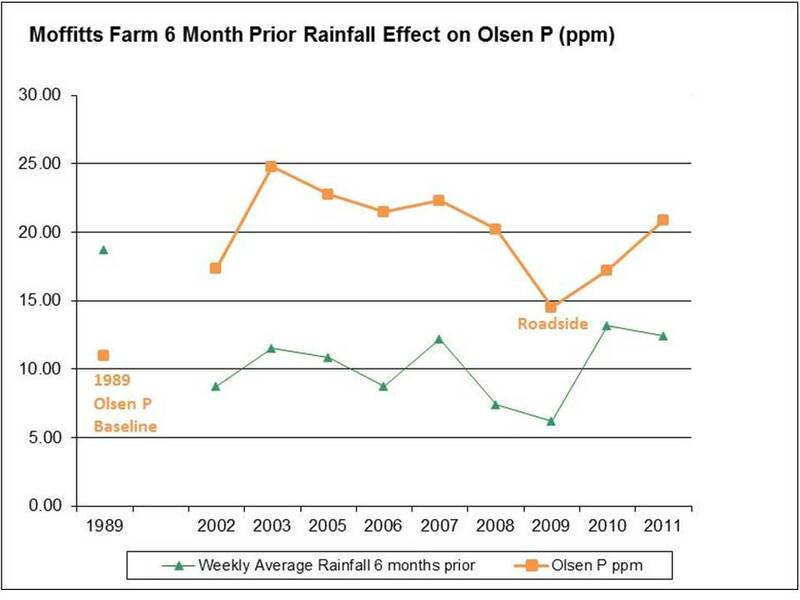 * Olsen P 14.5 – moderately high given no fertiliser would have ever been applied to the roadside. * Total P was 232 ppm. * Potassium and sulphur levels were low . 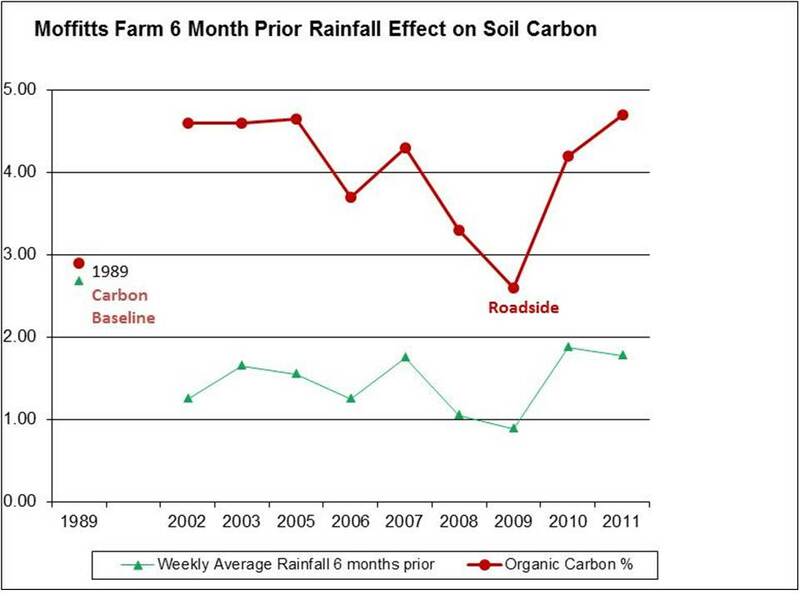 * Soil organic carbon was 2.6%, around 30% lower than in paddocks. 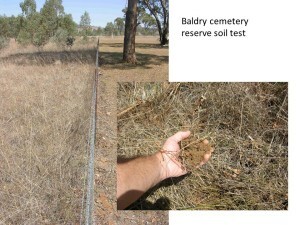 The TOC result is interesting and most likely reflects the relatively inactive pasture regime on the roadside compared with grazed paddocks where there is a far higher mineralisation of organic matter or carbon flow which contributes to nutrient availability and building TOC percentage above that of the natural ungrazed pasture. * Olsen P 16.6 – moderately high – no fertiliser would ever have been applied. Once again this result was surprising for a relatively high available P suggesting a healthy soil food web is present allowing good mineralisation of organic matter to occur. The TOC was not as high as anticipated given the prolific pasture growth present. This suggests soils have a TOC equilibrium based on aeration, water infiltration and the soil food web present. Fascinating, especially following your talk to Re-shapers yesterday. Thanks for all you are doing.